The Asado Rotisserie Barbeque has a powerful motor for driving the spit forks. The spit forks are capable of holding up to 4kg of your favourite meat. So instead of sticking to sausages and burgers why not roast a chicken for your BBQ – after all chicken is supposed to be much better for your health than greasy beef burgers!! A party sized BBQ cartridge (which is not included) can easily be stored in the holdall with the torisserie. 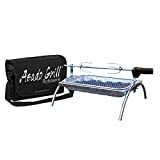 The Asado Rotisserie Barbeque is highly transportable, anda serious piece of BBQIng kit.